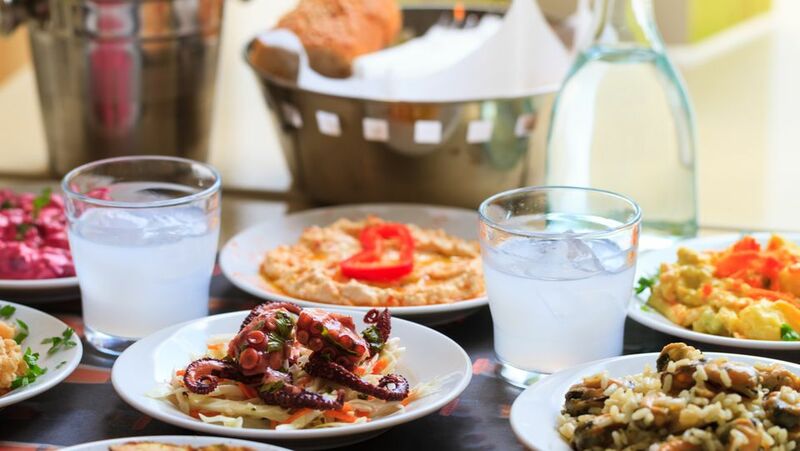 An ouzeri is an eating and drinking establishment that specializes in the serving of ouzo and the delectable mezethes (small dishes of foods) that go with it. You can turn your home into an authentic Greek ouzeri in a few easy steps. Ouzo is a delightful anise-flavored spirit with a licorice taste that goes down easily, but be careful because it's a potent drink. In the bottle, ouzo is a clear liquid, but once ice cubes or water are added, it turns a milky white. Ouzo experts say this is because oils in the ouzo are soluble in alcohol but not water. Whatever the reason, diluting ouzo with water tones down the licorice taste, but it still packs quite a punch. Ouzo is generally served as an apéritif or an after-dinner drink, but it's also a reason for friends to get together and enjoy good company and conversation at any time. To the Greeks, serving ouzo in an art. It is drunk slowly and is always served with at least one meze (a small dish of food) because of its potency. Ouzo can be served straight in a shot glass or, as most of us prefer, over ice in an old-fashioned or highball glass with a pitcher of water to dilute to taste. Ouzo is also an ingredient in several cocktails. Many brands of Greek ouzo are marketed around the world, from boutique brands to major labels, and each has its admirers. These are the most readily available and are generally 80 to 90 proof. A shot of ouzo can be poured over ice in a highball glass and topped off with orange juice or lemonade. Serve in a pony glass. Put 4 ice cubes in a shaker, shake and strain into an old-fashioned glass. Add a squeeze of lime, garnish with a twist of lime peel. Shake with 4 ice cubes, strain into an old-fashioned glass, and garnish with a slice of orange. Shake with ice and pour into a rock glass or old-fashioned glass. Pour ouzo and cordial into a highball glass with ice, top off with lemonade. Many thanks to the bartenders at the Proedreio in Arhanes, Crete, for sharing their knowledge and expertise.